LPU-Manila’s H444 Events Management class is providing an opportunity for local musicians to exhibit their talent and showcase the emergence of great talents and a diverse range of musical acts at Palacio de Maynila this month as they host Musikantahan: Oh, PinoyMuna! Battle of the Band competition on Friday, November 30. Eight bands from different colleges and universities will battle it out at 6:00 PM and will take the stage performing their 2-3 chosen songs. The participants have the chance to win cash prizes: 5,000 pesos for the first runner-up, 10,000 pesos for the second runner-up, and the champion will receive an amount of 15,000 pesos. There will also be special categories for them to win special prizes. Special guest performers Join the Club and I Belong to the Zoo will perform their hit songs. There will also be professionals who will give out their comments to encourage and commend the participating bands. 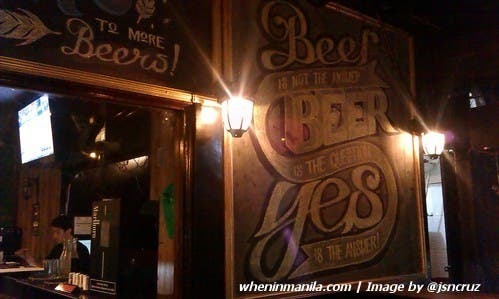 Moreover, the attendees will have the chance to win lots of raffles! The aim of the event is to introduce the discovery of talent and entice everyone to participate in celebrating, embracing and supporting the OPM – making its way to open the event for everyone. H444 Events Management Class’s Musikantahan: Oh, PinoyMuna! 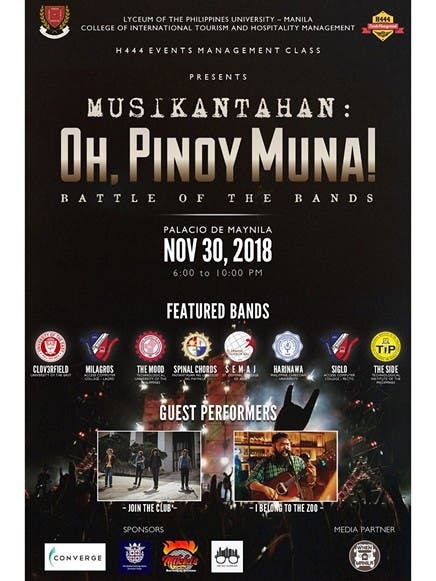 Battle of the Bands competition will take place on Friday, November 30 from 6 p.m. to 10 p.m. at the Palacio de Maynila along Roxas Blvd. Ticket price only costs 150 pesos. Only one band will win. Come and support who will rock the stage and witness such memorable and aesthetic experience! Design Surge 2014: 70 Designers. A Plethora of Inspiration. 1 Captivating Show.